Discontinued.The Intec 30se is a system gas boiler. It comes with an advanced combustion management, along with many other features to make it a reliable boiler. It has an efficiency rating of 89%, making it a B rated boiler. This boiler comes with an output of 30kW and has a one-piece casting heat exchanger, an additive valve and a single electrode. It comes with improved circulation to achieve a quicker warm-up, a PCB memory chip, high efficiency grundfos pump, and a hydroblock assembly. This boiler has combined condensate and PRV connection. It also comes with a change NTC and a clip-on DHW temperature sensor ( DHW Domestic hot water) as well as a pipe work cover tray. Along with all of these advantages the Intec 30se also comes with ways to protect itself including frost protection to help your boiler through the cold winter days and a daily pump kick to help it on those summer days or when you may not be using the boiler for a long time. 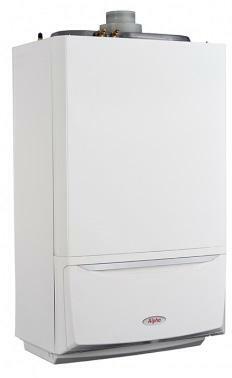 This boiler is also available in 20 KW and comes with a five year warranty. It is also available in natural gas or LPG (Liquefied petroleum gas) options.